Today we are interviewing Stanislaw Kapuscinski (aka Stan I.S. Law), author of the ALEXANDER TRILOGY (ALEC, ALEXANDER, and SACHA). 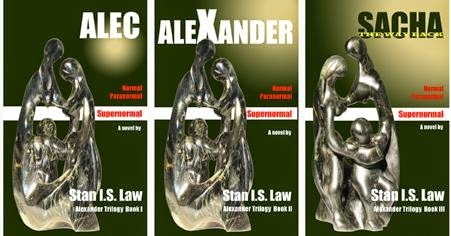 The ALEXANDER TRILOGY is a series of novels that follow the three generations of Alexander Baldwin's family as they strive to meet their ultimate potential, learning much about the world and themselves along the way. The series incorporates elements of fantasy, adventure, and romance. This trilogy, as all my books, is for all people who do not cast themselves into a specific genre but enjoy the complexities of life at physical, emotional, mental and spiritual levels. My inner-need to explore the human potential. Also my sailing, travels, (Also Heinlein’s “Stranger in a Strange Land”). As becomes a Trilogy, my favorite characters are Alec, Alexander, and Sacha. Since I retired from architecture, a good 25 years ago. Too many to mention. All works by Shakespeare? Tao Te Ching, Light Upon Light (Inspirations from Rumi), Bible, Secret Doctrine, by H.P. Blavatsky. Science, metaphysics, philosophy; although lately I read the stuff people send me asking for reviews. I hope I continue to evolve daily. Since as a writer I am only a reflection of my daily contemplation, of my trials and errors, of the awe at the world/universe around me, and even of a little anger at stupidity of the masses, which includes most politicians, I am—even as my writing is—a work in progress. As mentioned above, daily contemplation. Most of my inspiration comes at night. In the morning I just put it on ‘paper’. Much later I do the rewrite. In school I couldn’t speak any English—I’d just escaped from the communist regime in Poland. I learned English much later, mostly from voluminous reading. I don’t plan that far ahead. At the moment I have 2 more books in mind. Non-fiction. One—art and poetry (my wife is an accomplished sculptor). Two—collection of my blogs. 1. I am discombobulated by people asking me for autographed copies. I want them to enjoy my books, not me. I don’t matter. 2. People who take free copies, then downgrade them because they don’t understand them. Only my wife and some friends. Not many. Most don’t believe I’d written 30 books since I retired from architecture. They don’t quite understand that writing is more fun than practically anything else, and I am a hedonist. Not really. I used to pay for editing. Now only my wife, friends, and myself edit my books. I can do it only about 3-4 months after I finished the first draft. Proofreading is another story. I don’t see my errors at all. My mind corrects all errors as though they weren’t there. Yes. I started writing poetry, short stories and articles. Some of them become books, later. IMac. It’s 100x quicker to correct errors. I am touch-typist, of course. Without a computer I’d not have written 30+ books since I retired from my previous profession. Is there anything else you'd like potential readers to know about your books? Which one? I’ll give you a general idea. I’ll quote a reader of mine: If you think you might be immortal—read Stan I.S. Law. If you want to be sure—read Stanislaw Kapuscinski. But first and foremost, READ.